Ready to love your pressure cooker even more? Now you can make dessert out of almost any fruit that is past its prime… dangerously quickly! I had been searching everywhere to find a cheese and egg-centric apple cake that I had been served many times by fellow harried mommies in Austria over tea while our toddler children joined forces to destroy the house. Even my copy of Die Gute Kueche was no help.But I always thought that this not-quite-cake and not-quite-pudding texture would be a perfect candidate for the pressure cooker. Between desperate online searches, I remembered Veronika telling me that she used ricotta instead of their local cheese. I’m not a big fan of raisins, so I left them out – but Veronika’s always had them and plenty of walnuts, too. Not part of Austrian tradition is turning this dessert upside down – but I really like the drama (plus, you have to do it anyway to get it out of the bowl). The original likely didn’t use olive oil – but using olive oil in place of butter is something I really enjoy doing in my recipes (use the good stuff). So here’s my best guess as to how to make this delicious sweet that I ate often and gladly while living in Graz. 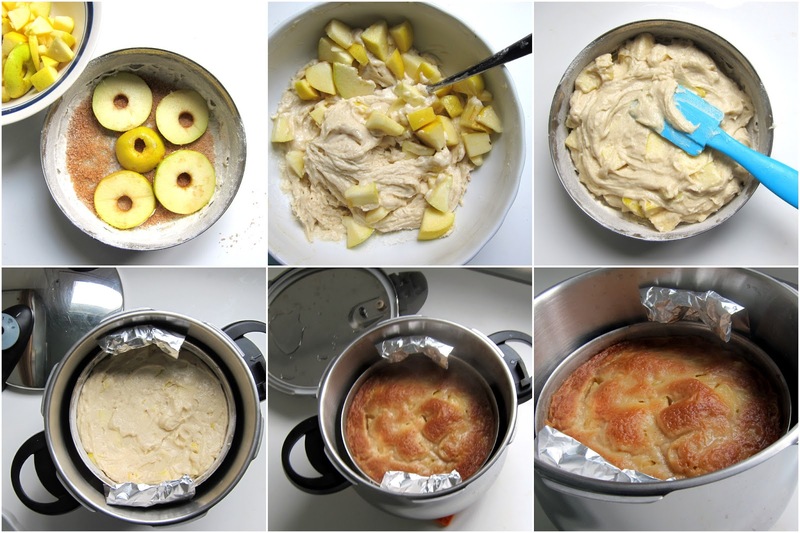 Austrian mommies: please leave your recipes in the comments – and now you know that you can make this cake in the pressure cooker! This recipe only has a "hint" of cinnamon, if you really like the flavor it brings to the party, double it. Other great additions to this cake are ¼ cup of crushed walnuts and soaked raisins. Substitute apples with pears, mandarins, nectarines, peaches or apricots. Prepare pressure cooker by adding water to the base, plus steamer basket and set aside. Slice one apple and dice the other and cover with lemon juice. Prepare a shallow and wide 4-cup capacity heat-proof bowl by adding a disk of wax paper at the bottom and oiling and dusting the interior with flour. Sprinkle the base of the bowl with raw sugar and arrange the sliced apples artistically. In a small mixing bowl, mix the egg, ricotta, sugar, olive oil and vanilla using a fork. Then, sprinkle the flour, cinnamon, baking powder and baking soda in the mixing bowl using a flour sifter, or fine mesh strainer. Blend well with a fork and then stir-in the apple dices. Pour into prepared bowl and lower into the pressure cooker, uncovered. Test for doneness by inserting a toothpick in the middle - if it comes out dirty lower back into the pressure and cook for a few more minutes (you can open the pressure cooker with the faster Normal release method the second time ; ). Turn the cake out onto a serving plate. Serve warm or chilled. I think that the recipe you remember is what an Austrian neighbor taught me in Munich. It’s called an “Auflauf” and is made with semolina. Here in the states I use farina cereal when I can’t find semolina, and ricotta cheese because I can’t get the fresh cheese that’s sold in Germany. Cottage cheese doesn’t work. The little curds of cheese turn into hard little bits, they don’t integrate smoothly like ricotta. The texture is not that of a cake, but solid. It bakes in the oven for @ 1 hour, topped with apples. I will put the recipe in another ‘reply’ for you. I use a Cusinart Electric, and have never considered using a stove top PC. If I can make this Auflauf quicker in the PC, I’ll be very happy as it’s one of my favorite breakfast dishes..
Irene, thanks so much for enlightening me AND sharing the recipe – let me know how it turns out for you steamed in the pressure cooker! Mix all ingredients, except apples, in a large bowl. Butter a large pan (a deep dish pie pan or a square Corningware pan, for example). Pour in mixture then top with apples in circles. Bake for 45 minutes, then check center for doneness. Love the instructions, in fact, this sweet was always served to me out of a rectangular pyrex casserole!! I made this recipe last night! I cooked for 15 minutes in my stove top Kuhn Rikon and tested with toothpick but I guess I did not go deep enough because it was not finished in the middle. We ate the part that was done however and it was delicious in spite of the apples needing to cook more. One thing I did alter in the recipe was that I added salt. The Ricotta I have has very little salt. For me, everything needs a little salt, so I gave the raw sugar a little sprinkle of sea salt before placing the apples, and I also added a good heaping quarter tsp to the batter, along with a handful of walnut pieces. Instead of Olive Oil, I used brown butter (Ghee) which I make. I used Pumpkin Pie spice. The next time I make I will slice my apples thinner and also use smaller apples. I cut my apples for lining pan in wedges accidentally and they did not fit well. Next time I will do thin rounds. I will go for 20 minutes! This morning I decided to try again with frozen blueberries. Mixed up the batter adding salt, and used 1 c frozen blueberries, cooking on high for full 20. When pressure came down I checked for doneness and still seemed a little jiggly in the middle, so I brought back up to pressure for 2 minutes with natural release. Better. The cake was delicious but still a tad bit wettish in the center. It also appeared that the blueberries floated to top but it turned out to be an added benefit to have a thick layer at the top in my opinion! I’m glad I added the extra sugar because it was just sweet enough without being too sweet. Thinking of Cook’s Illustrated tricks I may add a bit of Instant Tapioca the next try to perhaps firm it up a bit, or maybe letting blueberries thaw or use fresh in season would do the trick! Thanks Laura for the great recipe! I’m sorry! I meant to post a photo of the Apple version of the cake. As you can see the apples were sliced a bit too thick, sliced the wrong way :) and cake looks nothing like yours did. I’ll keep trying! What size apple do you recommend for this recipe? I love the blueberry variation! I think the blueberries are much more liquid than apples, so that could have caused the problem. Also, try to get the widest dish your pressure cooker can accommodate for the cake can be a little shallower and more cooked-through. Glad to see so many variations coming from this recipe! I have settled on 23 minutes (I’m 4000 ft above sea level) and the cake is pulling slightly away from the edges and appears to be finished. There has been a white-tish area on the center of the cake before flipping that looks like water has been dripping, and when it’s cut the cakes are soggy in that area, plus my cakes are sinking in the center after being flipped when they cool. If I make a long enough foil helper and connect the two ends in the middle would this be safe to try since it would sort of sit under the regulator? Maybe then the water would run down the sides of the foil helper and would make it’s way back to the bottom of the pot without landing on the cake? Any thoughts appreciated. Thanks and Happy New Year! What is the width and depth of the container you’re using to make the cake? What material is it? I ask because if the container is too deep it may be un-cooked in the middle also pyrex and ceramic heat-proof bowls are slower to heat than aluminum and stainless steel. Yes, you can absolutely fold the helper handles over the middle and see if that helps, also when removing the lid, be sure to tilt it in a way so the condensation does not drip back onto the cake. Another solution, is to use a small tube pan – no middle, nothing to get soggy! I think you’re right! I hadn’t thought it could be the container…It is a Corningware bowl (the French White type) 7 and 1/2 by about 3 and 3/4 deep. I need to add a tube pan to my selection! Thanks Laura! You mention using mandarins or oranges. Would you peel them & put the sections in place of the apple slices? Oranges are a little large, but seedless mandarins and tangerines should be peeled and you can toss the wedges whole! Thanks for the great recipe! I teach pressure cooking classes at Chef’s Catalog and made this recipe in both a stovetop Fagor and an Electric model both results were given high praise! Of course I credited you! Thanks for letting us know about the success and sharing the source of the recipe, too! This was so good I had to register to compliment the recipe. I used brown sugar instead of raw sugar since I didn’t have it and the substitution was just fine. I used a 7″ springform and 20 minutes in my Instant Pot at high pressure wasn’t quite enough, so I put it back in for 5 minutes and it was perfect – moist and delicious, especially topped with ice cream and fleur de sel caramel. I am going to try a variation with sliced mango and cardamom in addition to the cinnamon. Thanks for the great recipe and website in general. I’ve ordered your book and I can’t wait for it to arrive! Hi there! Did you make the clotted cream in your instant pot? Can you provide recipe? I was only able to find a recipe using a slow cooker. Thanks! This looks delicious! Can you tell me what variety of apple you recommend for this recipe? The photos show its unpeeled, so I wondered if there’s certain varieties whose peel works better. I am going to make this, but I thought about using my 6 cup Bundt pan that fits into my Cuisinart PC. Do you think this would be similar to using a tube pan and help the center cook more evenly? Absolutely, that’s a great idea! The “upside down” will be really showy, too. Take a pic!! I just took the cake out of the PC. It looks wonderful. Here is a picture of it made in the Bundt pan. it is too hot to taste, but it smells delicious. It tasted wonderful too. I used more cinnamon and used my mandolin to slice the apples for the top and also to chop the apples for the batter. Since I used the Bundt pan, I couldn’t do the waxed paper lining, but I sprayed it with non-stick spray and it came out without a problem. I love this recipe for many reasons, but one of the reasons was that I needed something to use up the other half of the ricotta container after I made your Mac and Cheese Italian Style. This is perfect!! I made this cake again, but I used pineapple rings instead of apples. It came out wonderful. Here is a picture of this cute little cake. Ann, this is sooo pretty – and that funnel form makes it really fancy. So glad you shared a photo with us. Yum! P.S. But, my god, gluten-free pasta does not soften EVEN under pressure!!! I’m looking forward to your gluten free creations! I sure hope you post those! Bisquick makes a GF version that works really well, check it out! I made this and my wife said it was one of the best tasting cakes she’s ever had. It was a really big hit with everyone. I also had a difficult time figuring out which container I should use and then I thought of bakelite! It’s also known as melamine. One of the first attempts at making plastic. It’s perfectly safe and can withstand some heat. Those cheap hard plastic bowls, plates and glasses can stand up to the temps that a pc reaches. Would anyone happen to know the nutritional info on this original recipe? I have a very strict low fat diet that I have to stick to for my hubby? I have just updated the recipe to include the nutritional information. One large slice (1/8th) will provide 241.6 calories with 9 grams of fat. These nutritional facts use “whole milk ricotta” you might be able to lower the fat content even more by using reduced-fat ricotta. I can’t wait to try out this recipe but I have a question about “doneness”. I recently made a cheesecake and wasn’t sure if it was done in the middle but erred on the side of underdone than overdone. The directions say if the cake isn’t done, cover and cook a few more minutes. I would like clarification about the release method after the few extra minutes. Do you let it go another 10 minutes of natural release or quick release after the extra time? Thank you. Rumi, you can use the “Slow Normal” release for the second time. That’s because if the batter is pretty much solid, it won’t boil and bubble to scramble the cake during the faster pressure release. But you still don’t want to do it TOO fast (Normal) because you don’t want the steaming liquid to splash onto the cake! I tried to read comments if anyone used a 7 in springform to make cake ? I have a IP-lux . Do you think it is to small to for your recipe? Ps I just found out the the Ipot comes from my home town go figure. Could anybody explain # 7 of the direction? Just got one and maybe I am asking a stupid question…….how do you lower the heat to maintain pressure? Do you use the LESS button or the adjust? Thanks, I really want to try this one, it sounds like a cake my aunt in Italy used to make, good memories ! That detail is for stove top pressure cookers. Your electric will sort it out for you. Laura has gotten better at writing for both types. but she hasn’t reworked all her old recipes yet. Sorry or the confusion, Paola. I have updated the recipe with specific instructions for your electric pressure cooker. Don’t forget to come back to post a photo when it’s done!!! Had you thought about a Bustrengo prepared in the instant pot. Since it is short and dense it would seem like a prime candidate for the IP. This was not a big hit for me. While the apples were good and tart, I was left with an overpowering taste of baking powder/baking soda. I also thought it could use a bit of salt, and maybe a bit more sugar. I will make it again, but will cut the baking powder and soda to a half, maybe add an egg, and augmente the sugar to 1/3 of cup? This was my second cake in the IP and i am pretty happy with the texture of it. Just the right amount of moisture! Thank you. I have made this twice now and it has been a big hit with workmates! I have to cook mine 5-10 minutes longer. Thanks for a yummy recipe. What diameter of pan did you use? And what size pressure cooker do you uze?